I often find different items from alabaster in the charity shops, like vases, ashtrays or trinket boxes etc, but I think this is the most interesting and beautiful from all of them. 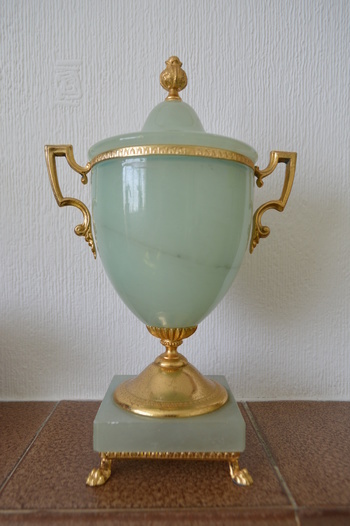 It's a 9.5'' tall urn from green alabaster with metal handles, rim and foot. I'm not sure about its age, probably late 20th century? It's sold, so now on it isn't mine, tomorrow I have to post it, but if anybody has more info about the urn, I would like to hear it. Thank you nutsabotas6! I'm quite a hoarder and easily become emotionally attached to things I like. Lovely, as ever! Nuts, took the words right out of my mouth. Very beautiful tone of green. Thank you Glassiegirl and Caperkid, you are lovely as ever :) !!! And many thanks to everybody for the love xoxo. Thank you Fiona for your nice comment!!! Thank you Shareurpassion and OneGoodFind for your nice comments/info! OGF - I'm blushing, you are very sweet...but I know I know very little. About your info - I looked it up and it seems Walt Disney and the Italian Ducceschi (producer of alabaster carvings) collaborated in the past, the Italians produced WD themed trinket boxes for the US company. Does your trinket box have a WD character on it? I had some Italian trinket boxes in the past - without animation characters and WD stickers. They had only the Ducceschi sticker or nothing. 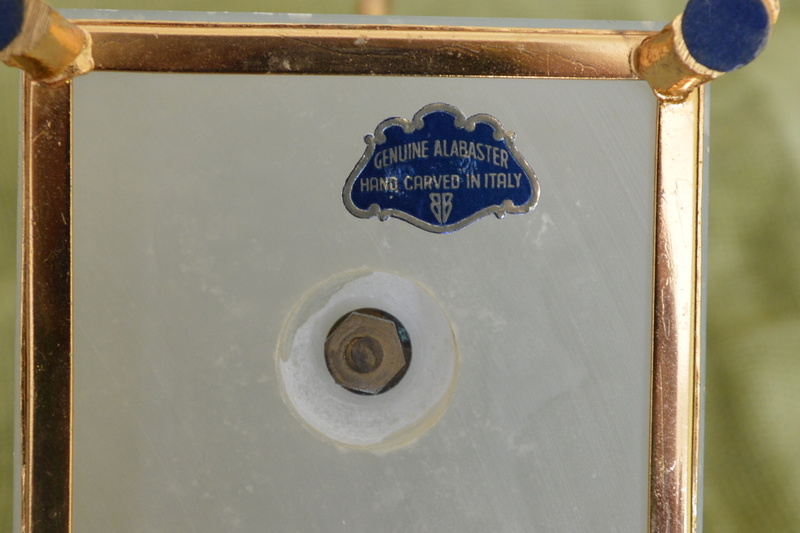 Now I'm thinking about it's quite possible this urn was produced by the same company. Oh my -- Delicious Piece !! Efesgirl, thank you - it was for me one of the kind find. It is same here too - the junk shops and charity shops are full of the common trinket boxes, but sometimes I get lucky. When I first spotted this urn, my heart jumped. But I have to sell many of my items, I just haven't got enough space. Now somebody else is enjoying this urn. Wow, this is lost very martika, I can't believe I've missed so many of your items!